This is what you get if you leave me on my own for the day. I took this picture in the evening after work, and that’s my blue tea mug there from breakfast, my stein from the night before and every pot that was used throughout the day. My poor husband. After taking the picture, though, I cleaned it all up. I do do housework eventually but it might result in a dirty kitchen for most of the day. I’m still working on getting better at this. My inability to cope with housework over the past two days was also due to the fact that I’m stuck at two creative projects I’m working on. Oops, make that three. I started to blast through one of the blocks though. The best thing about a dishwasher is that it allows you to hide things. We have a dishwasher, but seldom use it. Unfortunately, because we always eat at home, that means that there are always dishes drying in the drainer or sitting in the sink waiting for the next time someone washes. Once in a while, I’d like my kitchen to look tidy. Unfortunately we dont have a dishwasher, so that alway dishes are (visibly) waiting to be washed. But we dont wash every day. They wait at a predefined place (not in the sink, because there they disturb). 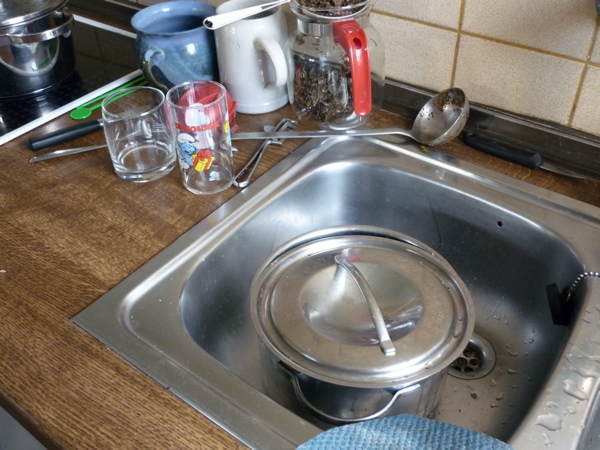 And when someone is in the mood to wash (in winter more often, because you get warm hands) or when the space is overfilled, or when cooking means waiting, then all the dirty dishes turn into clean dishes – but still visible in the drainer. And when they are dried (I dont dry with a towel, this work in my opinion hasn´t to be done) they will be removed. This is often in the morning while preparing breakfast, or later on while cooking.